CENTAC 2019: The CENTAC exam conducted to give an opportunity to get admission to the first year of MBBS., BAMS, BDS, and many other Professional UG Degree courses. These Professional UG courses are offered by the Government Colleges, Colleges run by societies of the Government and seats offered by the Other States are done by the Centralized Admission Committee (CENTAC), Government of Puducherry. For UG courses there will be no entrance exam conducted for offering admission. 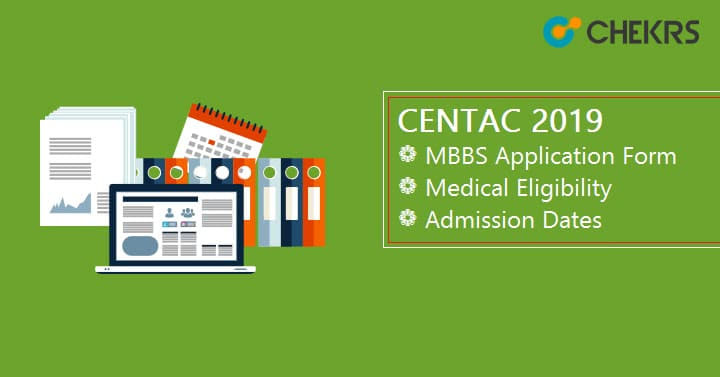 In This Article, we are going to share all the information about the CENTAC Exam 2019 for admission in MBBS and BDS Courses including the details of CENTAC MBBS Application Form, Medical Eligibility, Important Dates. Candidates seeking admission to the MBBS, BDS, Degree courses must Check these CENTAC Medical Eligibility Criteria for MBBS and BDS. The aspirant should be the Indian citizen. The French Nationals residing in UT of Pondicherry are also Eligible for the CENTAC 2019. If he/she has the domicile certificate then he/she will be considered to belong to the UT or Puducherry. Candidates must have passed H.Sc. (Academic) examination conducted by the Board of Higher Secondary Examination of Tamil Nadu or any other equivalent thereto. Candidates must obtain a minimum of 50% marks (40% of marks for OBC/ BCM/ MBC/ EBC/ BT/ SC candidates) in aggregate, in the prescribed subjects of Physics, Chemistry and Biology or Biotechnology, Botany and Zoology. They should have studied and Passed English as one of the subjects and they must have passed the above four subjects individually. Above criteria will give you hint about your Eligibility for the CENTAC Exam. If you are Eligible for the CENTAC 2019, we are providing here the CENTAC 2019 Important Dates or expected dates. So you will be aware of all the Events of CENTAC. CENTAC Application Form will be available in the 2nd week of May 2019. Candidates can fill the CENTAC form till the last week or 4th week of May 2019. Candidates have to fill the application form through the official website then they have to send the hard copy of the Application form to the Official Mailing Address which are given below in the procedure. Candidates will also require some Documents at the time of filling the CENTAC Registration Form or application form which is listed Below. All the candidates have to Visit the Official website for Registration. Click the Option with test Professional UG Courses. Now Click on New Registration and Register yourself with proper and correct information. Now Find the Link for the Registration Form or Application Form. Fill all the details and provide valid Contact details. After filling the CENTAC Application Form 2019 upload the scanned image of the photograph of 20 KB to 25 KB in JPG format only. Download and print the filled Application form and sign it. Candidates will get admission through CENTAC 2019 in the MBBS & BDS only on the basis of NEET 2019 scorecard. The authority will publish the CENTAC Seat Allotment List 2019. The authority will also release the vacant seat matrix on their website. After the declaration of Seat Allotment List, candidates have to download the allotment letter and report to the allotted college for admission before due dates. If candidates failed to report to the allotted college their seat and admission will be canceled. After it, they will not be allowed to participate in the next round of counseling and further CENTAC MBBS Admission Process.